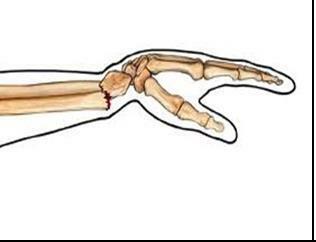 Colles’ fracture is a fracture of the distal radius and ulna (the bones of the forarm), which occurs after a fall onto an outstretched hand. It is most common in the older population but can also occur in young sports people. In the younger person, because the force required to fracture such strong bones is great, young athletes often also suffer intra-articular (inside the joint) fracture with this injury. Fracture is confirmed with X-ray and the treatment involves anatomical reduction and immobilisation for 6 weeks in a cast that covers the distal half of the forearm, the wrist and the hand, leaving the metacarpophalangeal (MCP) joints, or the knuckles, free. If the reduction is not accurate or if there is imperfect alignment of joint surfaces or inadequate restoration in length, internal fixation (surgery) is required. X-rays are usually taken every 2 weeks to ensure that the position in the cast is maintained. Once the cast is removed the wrist is usually very stiff with restricted range of movement in all directions. There is also marked weakness of the wrist muscles in all directions, and patients will have trouble opening doors or jars, or lifting coffee cups. Often the hand itself is also stiff and weak with grip strength is also greatly diminished. Leaving the patient to rehabilitate their wrist on their own following a Colles’ fracture can lead to delayed and incomplete recovery. Physiotherapy treatment can assist the rehabilitation of the wrist in many ways. 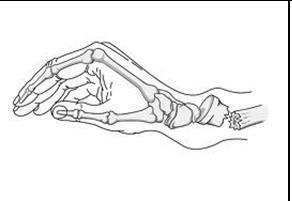 Specific mobilisation to the carpals and the inferior radio-ulna joint can improve joint range in all directions. Active assisted, active, and active resisted exercises are introduced to enable the patient to perform self-joint mobilisations at home on a regular basis. Exercises are also prescribed to increase strength through all ranges, particularly pronation and supination which are essential for simple every day activities such as turning a door-knob. Exercises to improve grip strength are also able to be performed at home by the patient and the physiotherapist can supply equipment to assist with the home exercise program.